"Weather is changing and so is naamsing,” retorts Renu Pegu of Hapekhati village on being asked about a fish recipe, relished exclusively by the Mising fishing community of Assam. People in her village, located on the banks of the Dhansiri river which flows along Kaziranga National Park, prepare the delicacy from locally available minnows and 60 wild herbs, including turmeric, yam and siju (spurge leaves). They say the nutritional content of naamsing is comparable to chhurpi, a hard cheese consumed by yak herders of Tibet. “It also helps prepare a quick meal after a hard day’s work,” says Renu, who helps her husband in running a paan shop. Minnows start rotting within half-an-hour of landing. So the Mising usually store them after drying. “For preparing naamsing, we crush the dried fish into a paste along with the herbs and stuff it in bamboo stumps, which are then sealed with leaves and clay from the river bank. At the time of preparation, we simply scoop out the paste, mix with water, add salt to it and let it boil for a few minutes. Till a few years ago, Renu and her family used to relish naamsing with rice almost every day. “These days I make it only occasionally,” she says. On an average, Assam receives the third highest rainfall in the country and experiences three waves of floods during the six-month rainy season that begins in April. As the rivers swell they connect the numerous waterbodies, rivulets and streams along the course. During pre-monsoon floods, when the Dhansiri is in spate, schools of fish migrate towards the Kaziranga National Park, whose 300-odd waterbodies serve as hatchery and nursery for fish and other aquatic fauna. They return along with the new batches towards the end of June, when the river swells again and the water bodies spill over. “This is when we cast our nets around the mouth of the tributaries from the park and get a good catch,” says Doley. This cycle has broken in recent years. The detailed project report for Climate change Mitigation submitted by Kaziranga National Park authorities to the Union environment ministry in 2016 states that the annual rainfall has decreased by 2.96 mm per year between 1951 and 2010. During this period, the mean temperature in the state has increased by 0.01°C per year, with pronounced warming during post-monsoon months and winters. Due to this changing climate and decrease in annual rainfall, there has been an increase in extreme rainfall events that are causing flash floods, says the document. Natural floods are boon to the community, says Pranab Doley, advisor to Jeepal Krishak Sramik Sangha, a local farmers’ and marginalised rights organisation. But the community is now worried about the changing intensity and frequency of floods and the amount of sediments they carry. Consider this. This year, Golaghat received 30 per cent deficit rainfall and was experiencing a drought-like situation. In August, 116 villages in Bokakhat sub-division of the district got inundated within a span of three days, following heavy rainfall and landslips in upstream Nagaland. The met department of Nagaland recorded 348 per cent excess rainfall in July alone. Experts say similar instances of flashfloods during droughts were also witnessed in 2009 and 2011, when the state recorded 20 and 30 per cent deficit rainfall. “Floodwater laden with sediments is not suitable for spawning, and thus affects the post-monsoon catch,” says Bothka Doley. Desperate by the situation, some are catching the fish migrating for spawning, ignoring a fishing ban from April to July on the rivers and waterbodies in the vicinity of the park. 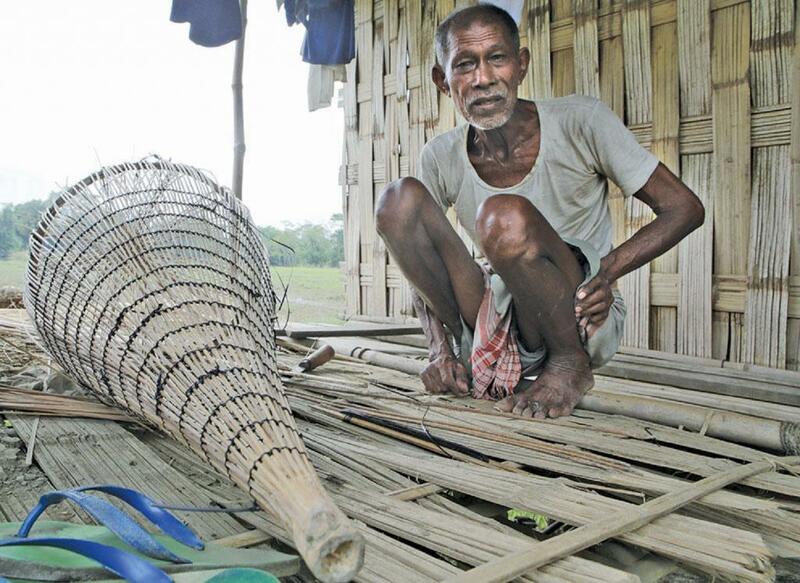 The dwindling catch has also dissuaded fish traders who camp on the sand bars at Dhansiri Mukh, where the Dhansiri meets the Brahmaputra, with large nets, own team of fishers for three to four months post monsoon. “Fish from Kaziranga is a prized catch. But it has now reduced by 2,000 to 3,000 kg,” says Momin Ali, a trader from Goalpara who comes to Dhansiri Mukh every year. “Earlier, at least 20 traders used to camp here. Heavy rainfall and increasing siltation load in the river has also changed the taste of naamsing and a traditional self-governance system. “Earlier we would wait for the land to emerge from the floods. The ideal way to dry fish is to spread it on the white sand in the winter,” says 76-year-old Holiram Miri of Rajabari village. But now, due to heavy siltation load, the river is changing its course frequently. Miri relocated nine times since 1977. As many as five villages in Bokakhat sub-division had to move away from the Dhanisiri and the Brahmaputra since 1999. “Most displaced people are living on the embankments. Here, we do not have enough space to dry the fish,” he adds. The 2015 report of the Centre for Natural Disaster Management, Assam Administrative Staff College, says a combination of factors, both natural and anthropogenic, contribute to flooding in the state. The primary reason, however, remains that surplus water generated by Assam’s dynamic monsoon regime is no longer draining away through the earth’s natural channels or old river courses due to the altered physiographic setting of the Brahmaputra basin after 1950,” it states. Worse, the communities have already lost their traditional system of cooperation and resilience, called rikbo-ginam. Under the system, explains Miri, the entire community would come to the rescue of a family if it needs help for, say, sowing or harvesting paddy or ferrying stranded livestock from a flooded area. In return, the affected family contributes to the community food basket which is used in times of calamity. “Now we have no one to fall back on,” he says.